Political action and technological advances are cutting down on the transfer of invasive species via ballast water. The ocean-going freighter Federal Polaris prepares to leave the harbor in Duluth, Minnesota. Stricter ballast water regulations and technological advances have slowed the transfer of invasive species into the Great Lakes. Stricter regulations and advances in ballast water treatment technology have reduced the introduction of aquatic invasive species (AIS) into the Great Lakes over the past decade. An innovative ship design that eliminates traditional ballast water systems completely could further cut down on the transfer of AIS, scientists said last week at a seminar hosted by the Chicago-based Alliance for the Great Lakes. Cargo ships currently pump water into their hulls to act as ballast—or stabilizing weight—and release that water when it is no longer needed, usually in a new location with a different ecology. More than 12 billion metric tons (3.2 trillion gallons) of ballast water are discharged globally each year and the shipping industry has been identified as the most likely pathway for nearly half of the 180 AIS established in the Great Lakes since 1849. Economic losses from AIS in the Great Lakes are estimated at approximately $US 5.7 billion each year, according to the Great Lakes Commission. 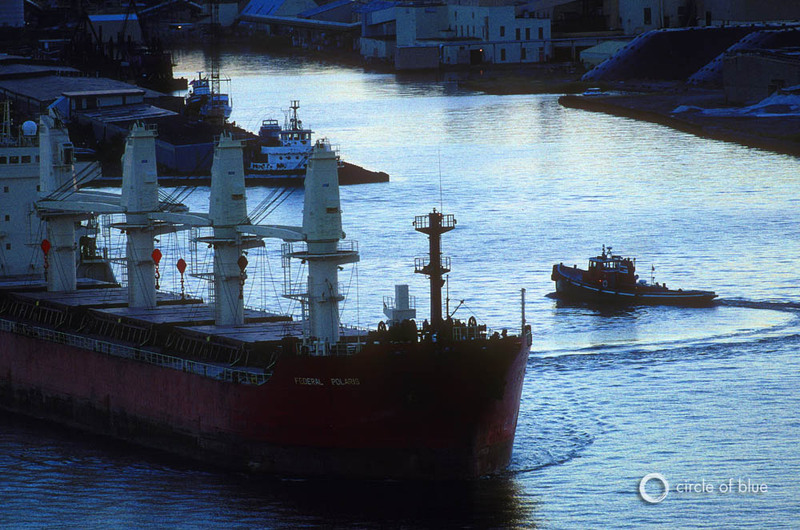 Since the early 2000s, state and federal governments, as well as the shipping industry itself, have pushed for and succeeded in implementing a host of more-stringent ballast water treatment regulations. Many ships now use systems that both filter water and either chemically or physically disinfect it to prevent the transfer of live organisms. Still, efforts to enact legally binding international standards for ballast water have fallen short. Most notably, the International Convention for the Control and Management of Ships’ Ballast Water and Sediments (BWM Convention) — adopted in 2004 — has not yet been ratified by enough member states to take effect. The combined merchant fleets of the 36 States that have so far ratified the Convention represent 29.07% of the world’s merchant shipping, Brown added. The United States has not yet ratified the Convention. Separate steps taken by the U.S. federal government and individual state governments have, however, reduced the risk of aquatic invasive species in the Great Lakes ecosystem. Data from the Great Lakes Aquatic Nonindigenous Species Information System (GLANSIS) show that 17 invasive species were introduced to the region via ballast water between 1990 and 1999. From 2000 to 2009, ballast water introduced only five invasive species. Furthermore, no invasions from ballast water have been detected since 2006, according to the International Joint Commission’s 16th Biennial Report on Great Lakes Water Quality released in April. Best management practices that implement ballast water exchange—for ocean-going ships that are carrying ballast water — and saltwater flushing — for ocean-going ships that have no ballast water but may contain residual sediments in their ballast tanks — are one of the reasons behind the decline in AIS introductions, Sarah LeSage told Circle of Blue. LeSage is an aquatic biologist and the Aquatic Invasive Species Program Coordinator at the Michigan Department of Environmental Quality (MDEQ). These practices either remove organisms completely from the ballast water, or create a high-salinity environment unsuitable for freshwater organisms that could become invasive in the Great Lakes. Ballast water regulations requiring further treatment and additional technologies will be coming into effect in the U.S. through both the Environmental Protection Agency and the U.S. Coast Guard, she added. “We know from experience that the best place to be is on the prevention end of an invasion,” she said, citing the ecological and economic costs of managing invasive species that have become established. Sea lampreys, for example, devastated lake trout fisheries after their introduction to the Great Lakes, and currently cost about $US 20 million to control each year. Zebra and quagga mussels, introduced through ballast water in the late 1980s, have caused major problems by clogging water-intake pipes and cost industries and communities more than $US 5 billion in the 1990s, according to congressional estimates. Though significant progress has been made in the Great Lakes, there are problems with the ballast water treatment technologies currently available that can create safety hazards, and may allow species to slip through the cracks. “The problem with using chemicals is that these are toxic, corrosive, and can be deadly to ships’ crews if certain things happen,” David Reid, a scientist at the National Oceanic and Atmospheric Administration (NOAA) Great Lakes Environmental Research Laboratory, said at the Alliance for the Great Lakes seminar. “And they can’t just be discharged into the environment.” Physical disinfection processes, such as ultraviolet light (UV) treatment, also have drawbacks related to dosage, water clarity and exposure time, Reid added. In 2004, researchers at the University of Michigan began looking at ballast water in a new way. “They asked: Can we forget about ballast water? Can we change the shape of the ship to not need ballast water at all?” explained Rudi Strickler, a professor at the University of Wisconsin-Milwaukee Department of Biological Science. The design, tested on a scaled model in the University of Michigan Marine Hydrodynamic Laboratory, allows water to constantly flow through the ship’s hull at a controlled rate from an intake at the bow to two outlets at the stern. Thus, organisms present in the water are not carried long distances. The technology is not without its own challenges. Allowing water to flow through the ship increases resistance, which also increases the energy required to move the ship by approximately 4.7 percent, Strickler said. More energy means more money, but without the expensive ballast water treatment systems currently employed on ships, the new design could actually reduce overall costs. Technology plays a large role in both preventing and managing invasive species, but it is only one piece of the puzzle, explained LeSage of the MDEQ.